Billions in Gold Is Stashed... Under the Streets of New York? Subject: Billions in Gold Is Stashed… Under the Streets of New York? Billions in Gold Is Stashed… Under the Streets of New York? Underneath the streets of New York, there's a literal goldmine — billions and billions of dollars' worth of gold. More than can be found in Fort Knox. In fact, this particular vault contains almost 25% of the world's gold reserves. Of that amount, very little actually belongs to the United States. The 540,000 gold bars in the vault belong to 48 foreign central banks, as well as 12 international organizations. Only 5% of the United States' gold is stored there. According to Mayerowitz, most of the gold came to the Fed after World War II. Foreign countries sought a safe location to store the yellow metal, and it was convenient that New York was one of the premiere financial capitals in the world. Foreign countries could more easily trade in their gold for fiat currency. If you live in New York or are familiar with the Fed, this may not come as a surprise: Tours of the vault are open to the public Monday through Friday. Even schools can make special arrangements for students to visit and learn more about monetary policy. In 2013, the Deutsche Bundesbank (Germany's central bank) announced it was removing 300 tons of gold from the Federal Reserve Bank of New York. It will also remove 374 tons of gold from Paris. That's because the Bundesbank wanted to hold 50% of its gold reserves in Frankfurt, Germany. It would still store the rest in New York and London, according to CNBC. "With this new storage plan, the Bundesbank is focusing on the two primary functions of the gold reserves: to build trust and confidence domestically and the ability to exchange gold for foreign currencies at gold trading centers abroad within a short space of time," the German bank stated in a press release. It makes sense for Germany to want to have its gold reserves brought home. You see, the United States has been very uncooperative with German bank officials in regards to inspecting their own gold. So much so that Bundesbank doesn't expect to have all of its gold back until 2020. Is the Federal Reserve Bank of New York Out of Gold? In an audit court, Bundesbank revealed that the United States didn't conform to common practices among central banks. 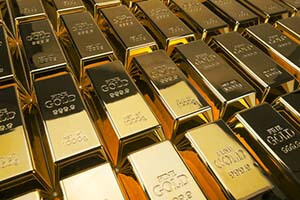 Officials from Bundesbank were not allowed to go to New York and take inventory of their own gold. According to Bloomberg, the New York Fed would only be receptive to the German bank taking inventory if New York Fed officials were allowed to use its own security and logistical constraints. The need for negotiations for Germany to access its own gold leads to speculation that the vaults (not the ones viewed on tours) are either completely empty or have far less gold than the bank lets on. "Gold is in more places than Fort Knox. There's some in New York City, as well as at West Point," Paul stated at a town hall meeting five years ago. "And there's already admission by our government: 'Well, that gold in New York City, we haven't been able to verify that for a long time.'" One of Paul's fears is that the Fed is actually loaning gold it doesn't own. Or, it's using the yellow metal as collateral on risky financial deals. "And we all know, and that's why the audit of the Fed is important, because there's a lot of shenanigans that go on. They'll loan the gold, and they'll use it as collateral on these international transactions." But according to Bloomberg, the Fed has stated that all gold bars deposited are present in the vault and the bank doesn't recognize any third-party rights or interests other than those of the account holders. At the end of 2013, conspiracy theorists once again pounced on the Fed when it was announced only 5 tons of gold from the United States had been returned to Frankfurt. At that pace, it would take 60 years for the German central bank to receive all of the gold it requested. But the Fed increased its pace of the gold delivery in 2014, delivering 85 tons, according to Bloomberg. Some believe that a high level of security is the main reason why it is taking the United States so long to return Germany's gold. After all, transporting gold that weighs tons and is worth billions isn't as simple as a delivering a pizza. Do you think the Fed has been lying to Germany and the rest of us about how much gold it has? Tell us what you think on Twitter @moneymorning and on Facebook. CNBC: Germany Wants Its Gold Back – Should You Worry? Bloomberg: Where Is Germany's Gold? Don't forget about China buying gold at the speed of global yearly production (buying gold at the pace of annual global production. and we still don't know hoe much gold they really have but with newly open gold exchange in Hong Kong chances are we will soon know. Maybe even gold-backed yuan will see the light of the day?